To effect a cohesive response to the local poverty situation in Bohol, the Bohol Program Framework on Poverty Reduction was formulated by the Provincial Government to provide a common basis for the Government and other sectors and stakeholders in identifying the specific interventions to address the development constraints associated with marked social and economic deprivations among the people. Prepared through a participatory approach, the Framework has been prepared to provide guidelines in formulating poverty-focused policies, plans and programs with the end goal of reducing the portion of poor families in Bohol from 48% to 30% by the end of the year 2012. The long-term priority is to ensure sustainable and pro-poor economic growth, as well as equitable social development. Under the economic development, the framework will emphasize two sectors: agriculture including fisheries, and tourism. In Agriculture, the pro-poor bias will be in assisting farmers achieve high productivity through their greater access to cost-effective and appropriate technologies; more markets for their produce; and credit facilities for increasing yield. The sector has the vast potential to reduce unemployment and contribute more benefits to rural families through forward and backward linkages in the production chain. In Fisheries, protection of the near-shore resources for small fishers against encroachment by commercial fishing remains a priority in many areas. Assets reform and protection of the poor in their access to production assets and technology support to livelihood activities will be an overriding concern. Co-management of forest resources and access to public land for productive use will be further explored. In Tourism, the anti-poverty focus basically consists of promoting Bohol as an eco-tourist destination. This strategy stimulates economic growth and provides direct cash benefits to the people which can, in turn, be channeled to improve nutrition and food security, housing, health and education and, on the whole, to an increase in the standard of living in the rural areas. Eco-tourism also promotes the conservation, protection and further development of the environment by the rural people themselves, rather than by external entities. 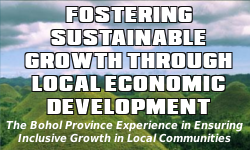 Its promotion in the province has the vast potential to benefit poor households and local communities. Education In education, poverty manifests itself in various ways: high dropout rates; low enrolments; poor performance of schools caused by lack of facilities and/or unmotivated teachers and pupils; poor attendance in school by pupils due to their involvement in family livelihoods or to long distance to school; and high illiteracy levels. The sector will continue with programs aimed at building more schools in the rural areas and assigning more teachers in these areas; equipping schools with basic facilities, improving school performance, and reducing illiteracy especially in barangays with high number of illiterates. The school curricula at various levels will seek to improve computer literacy to ensure the relevance of acquired skills to global trends. Science and mathematics will also be given added emphasis, along with courses relevant to the expected growth in tourism and agriculture-based industries. The special Education Fund of the province will be used to uplift the status and skills of locally hired teachers. More scholarship grants will be provided to children from poor families and communities. Health In Health, the Provincial Government is committed to helping families prevent the increase in poverty through assistance to meeting health needs which account for a significant portion of a family’s meager resources. The sector fully supports national programs such as PhilHealth for the indigent (medical insurance for the poor); immunization; nutrition; and primary health care. Water supply and sanitation will continue to be given more attention and project resources. More clinics will be built and health personnel deployed in the rural periphery to provide adequate curative and preventive health services. Social Welfare In Social Welfare, the key concern remains to be the advocacy and actual service delivery to population groups marginalized by limited access to social and economic opportunities. Arts & Cultural Development Bohol has a thriving arts and cultural community which plays an integral role in the social fabric of province. The Provincial Government plays a significant role in arts and cultural development by supporting activities through its promotion, assistance and provision of facilities. In Infrastructure, the Province will complement planned mega projects (Leyte-Bohol Interconnection Project Phase II, Bohol Irrigation Project Stage II, Bohol Circumferential Road Improvement Project Phase II) with farm to market roads to benefit farmers and rural villages directly. The sector will promote greater access of farmers and other rural dwellers, particularly those living in remote communities, to development inputs and market through improvement in communication and the provision of affordable power and energy. In Development Administration and Governance, the main concern will be the cutting down of bureaucratic red tape so as to facilitate easy access to services by the people, most especially those in remote rural communities. It also involves strengthening provincial and local governance. In Environment, the Provincial Government is determined to minimized and, eliminate these counter-productive and anti- ecological practices. It is committed to help liberate the poor from the constraints of underdevelopment in ways that do not further damage ecological resources.